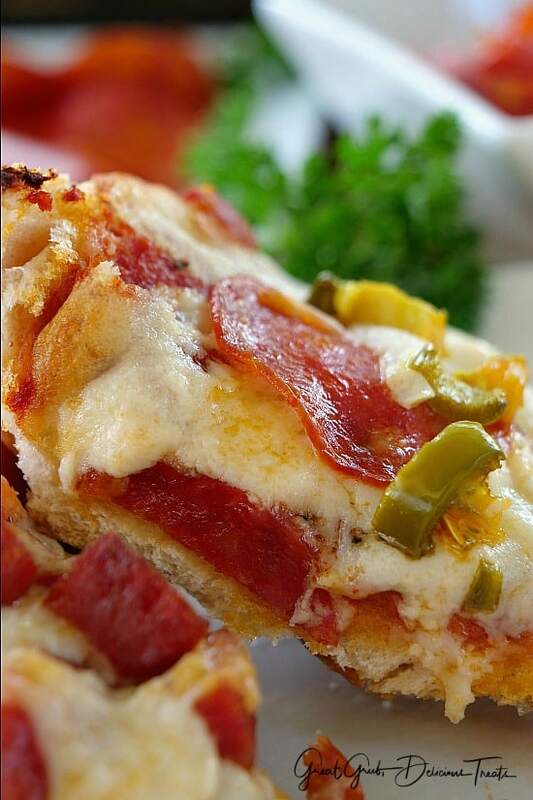 If you’re like us, having pizza bread as a quick meal is something we eat often. 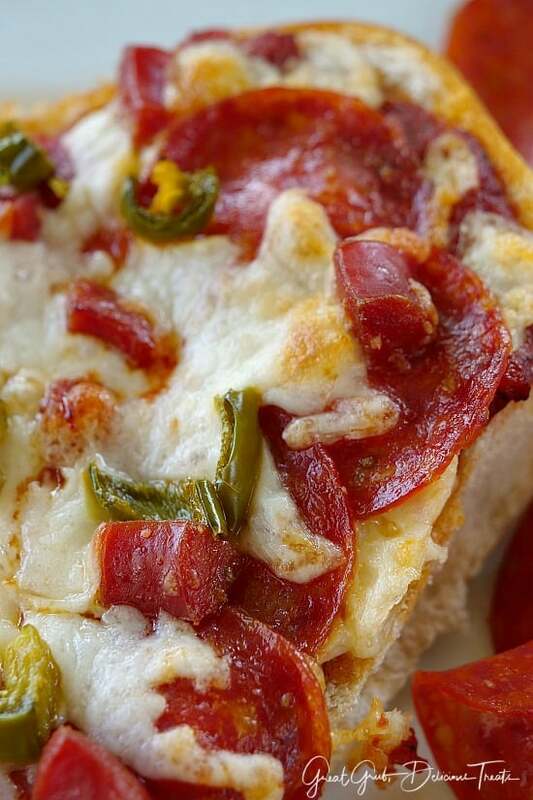 What’s even better is to make your own homemade pepperoni lover’s pizza bread. 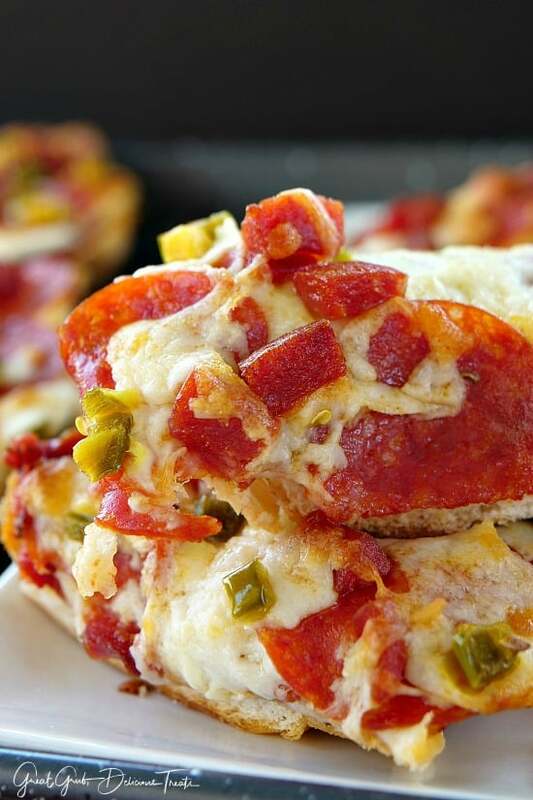 This pizza bread is super good and loaded with pepperoni, jalapeños and ooey, gooey cheese. 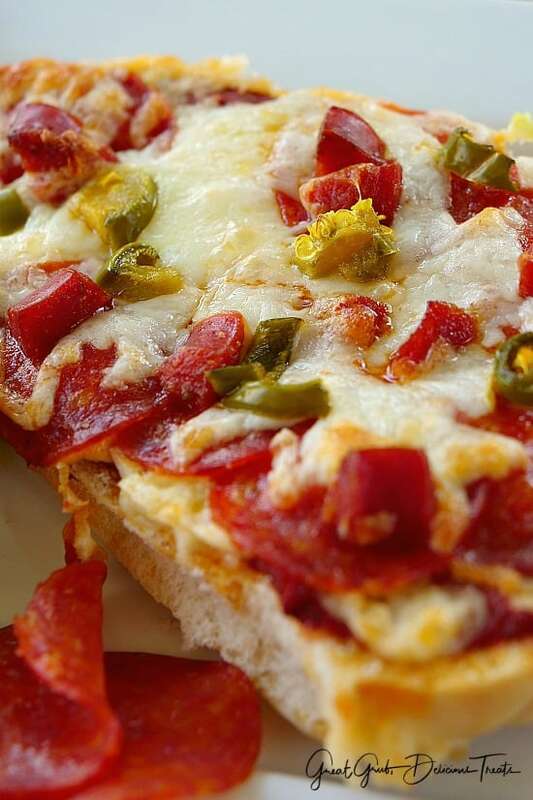 Pepperoni with jalapeños is my all-time favorite pizza. 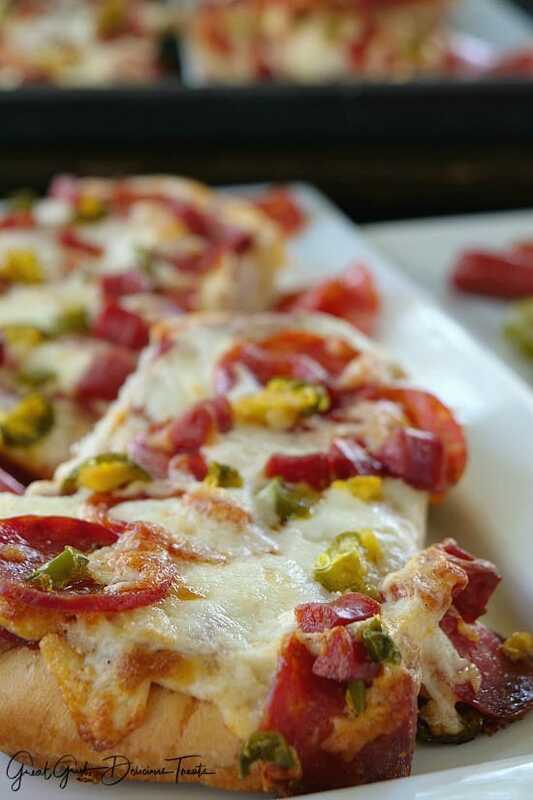 What’s great about this pizza bread is that it’s loaded with pepperoni slices and pepperoni chunks, along with lots of mozzarella cheese. 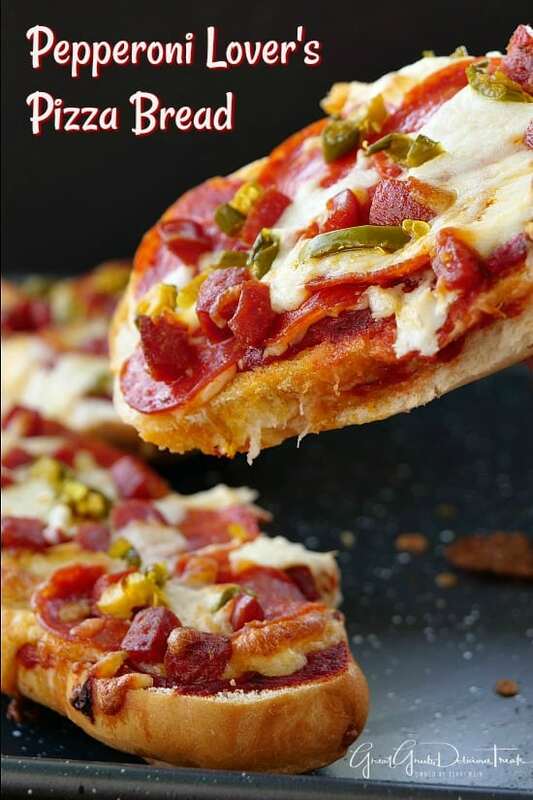 Perfect for the pepperoni lovers out there! 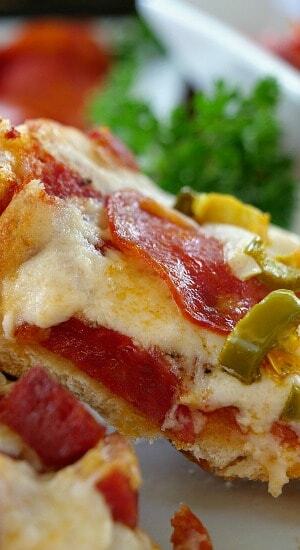 Grab a 6 pack of rolls, cut them in half, spoon some pizza sauce on each half, cover with mozzarella, add a layer pepperonis, then pepperoni chunks, more cheese, more chunks of pepperonis and finally top with diced jalapeños. Next, pop em’ in the oven at 400° for about 20-25 minutes and in no time, these delicious pizza breads will be pipping hot and ready to devour. Look at all that pepperoni. Oh so good! So I actually made this pepperoni lover’s pizza bread first thing this morning because it’s been SO HOT here in the SoCal desert. 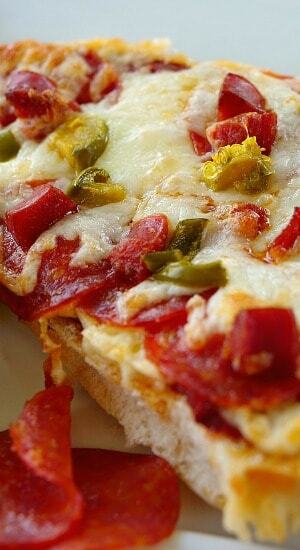 Having pizza bread for breakfast wasn’t too bad. ;) I can’t even turn on the oven because it’s TOO hot, and humid, right now. Usually we have a dry heat here, but mother nature is being a bit difficult. Add all your favorite toppings and load it up. Having additional ingredients are only going to make this more tastier than it already is. Throw on some mushrooms, black olives, bell peppers, sausage and make it a supreme. 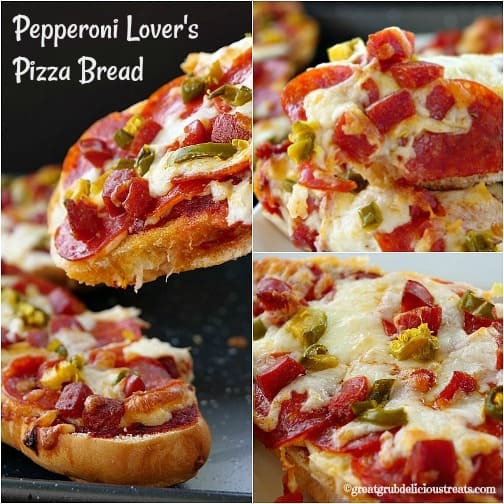 Are you ready for some pepperoni lover’s pizza bread? This is a favorite at our house. In a medium saucepan, heat olive oil over medium flame. Saute onions and garlic for about 5 minutes. Pour tomato sauce, tomato paste, and water into pan. Stir. Sprinkle oregano, basil, salt and pepper into sauce, stir. Cover, reduce heat and simmer for about 20 minutes. Cut each roll in half, lengthwise, and place of a baking sheet. Slice pepperoni stixs into small chunks, I cut each stix into 4 long pieces and then cut into desired size chunks, set aside. 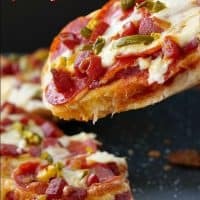 Spoon sauce over each roll, cover with mozzarella, add a layer pepperonis, then pepperoni chunks, more cheese, more chunks of pepperonis and finally top with diced jalapenos. Pop em' in the oven for 20-25 minutes or until cheese is starting to brown and bread is crisp.